Saturday at CPAC 2011 Federal Communications Commissioner Robert M. McDowell discussed the FCC's December 21 order for government regulation of the internet. Commissioner McDowell began his remarks with a brief history of internet legislation. McDowell points to the Clinton/Gore legislation from 1994 which put control of the internet into private hands "[the internet] became one of the greatest deregulatory success stories of all time...it became a little bit of libertarian heaven in that regard." However, on December 21, 2010, the FCC took steps to implement a regulatory Rubicon that is anti-freedom. 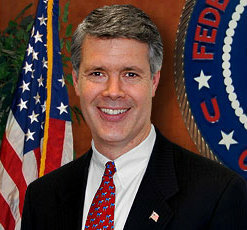 Commissioner McDowell had four basic complaints regarding the FCC's order. First, McDowell maintains that nothing is broken with the internet. Second, the FCC does not have the authority to regulate the internet "The FCC, in its action on December 21, defied a court order from last Spring...as well as a large bi-partisan majority in Congress. Last year 302 members of Congress wrote to the FCC, including 86 Democrats, in one form or another saying 'leave this matter to Congress,' or something along those lines...so this is really sort of jaw-dropping interventionism, in my view." McDowell also maintains that there are Constitutional issues involved under the Fifth Amendment regulatory takings clause and under the First Amendment free speech clause "These are private platforms, these were not built with public money, these were built with private risk capital...Would we think this was such a good idea if the government started dictating how newspapers could manipulate their content? Of course not. That's a different platform, but it's a very strong analogy." The third reason that Commissioner McDowell dissented in the FCC's order is because he believes that the order will cause irreparable harm by deterring deployment [of internet technology] throughout the country. The fourth reason for his dissent is "there is existing law that prevents all of the fears that have been thrown out there for the past eight or nine years with the term 'net neutrality, which sounds good if you say it fast...the anti-trust statutes, section 2 of the Sherman act...section 5 of Federal Trade Commission Act...those are all covered..."
McDowell says that what is most frightening, however, are the international implications of what the FCC did. "For a number of years, since the internet was actually migrating further away from government control, a lot of our international neighbors have been trying to impose more control...this is frightening...when you look around the globe it's not private sector mischief with the internet that's occurring, it's state intervention that's occurring..." McDowell says that by imposing its own regulations on the internet, the U.S. has lost the moral high ground "[The U.S.] is forced to say now, no, no, no, you other governments, don't regulate the internet the way you think is reasonable, we're going to regulate it the way we think is reasonable...It becomes a matter of where regulation only seems to grow." McDowell closed his remarks by paraphrasing one of his favorite Ronald Reagan quotes "there are those who if they see something moving, they tax it. If it keeps on moving, they regulate it. If it stops moving, they subsidize it." Mr. McDowell is brilliant and absolutely right. The FCC has not been empowered to regulate the Net. It has seized this power, at the behest of President Obama, so that it could impose rules that benefit campaign contributor Google. Google is, essentially, Obama's Halliburton.